While you could already control who could view what content by restricting it to certain users and groups, you needed to set this up again and again for each of the categories or articles you wanted to lock down. This would quickly become a pain if you wanted to change that access control in a number of places later on. Now, you can create a single Smart Group and assign it to as many articles, categories, or modules you like. When you want to change how the access control works, you'll only need to change it in one place and it will be reflected everywhere! If you have previously migrated, you will simply be redirected to the dashboard. If you have not, simply click Migrate Now. 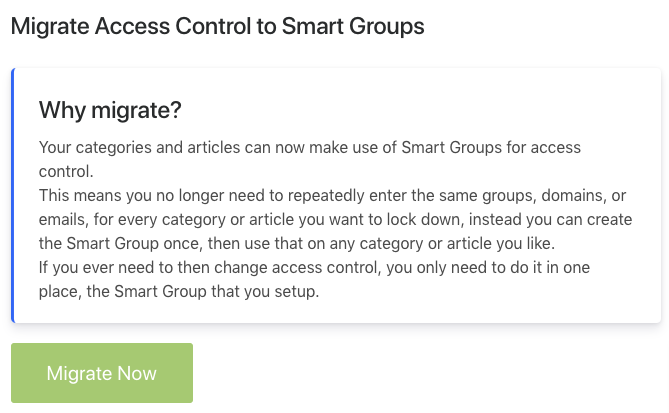 The system will automatically create new smart groups based on your existing access restrictions and assign each category and article to the right groups. If the migration completes successfully, you will find the generated smart groups on the Smart Groups page with the names Smart group 1, Smart group 2, etc. You can then click any smart group to provide more appropriate name and description, as well as confirm whether it has been assigned to the right content by scrolling down to the Entities Using this Smart Group section. In the off chance there is an error during the migration, please contact us, and we will get it sorted for you. Rest assured the changes will be automatically rolled back when this happens so your content will not be affected.